Adam Rapp’s play, inspired by the real-life banning of his young-adult book by a school district, takes culture war to some odd extremes. 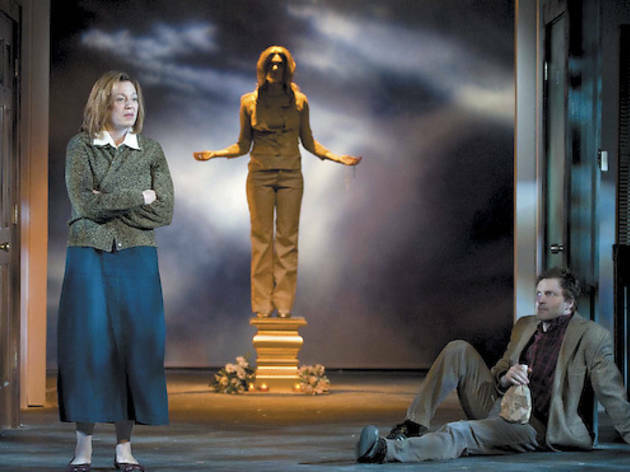 Playwright Rapp is also the author of a number of books for the young-adult market, one of which was stricken from the high-school curriculum by a Pennsylvania school board in 2005 for its sexual references and graphic language. That episode is the clear inspiration for this 2010 play. But as Rapp’s stand-in, the recently divorced, creatively blocked, drunk and self-pitying Tobin Falmouth (Sean Cooper), discovers when he travels to Midlothia to defend his book, there’s more to this culture war than meets the eye. In Tobin’s book—written so long ago he barely remembers his own plot—pregnant teens are disappearing from a small town, each mysteriously replaced by a bronze statue in a cornfield. Inspired by the book and its confiscation, a group of Midlothia teens led by precocious Vera Dundee (Caroline Neff) have started getting pregnant intentionally, with plans to run off and start a commune; their opposite number is the “Pork Patrol,” teenage boys in Porky Pig masks inflicting property damage and bodily harm on those promoting culture they don’t like. Rapp, a Joliet native, has an ear for his story’s heartland characters, but he doesn’t have much sympathy for them. Despite some interesting commentary on artistic intent and impeccable performances by Schultz’s cast (with outstanding turns by Cooper, Laura T. Fisher and Paul Fagen), Rapp’s newfound naturalism doesn’t sit well with the nihilistic surrealism held over from his earlier work. This Metal’s not as heavy as it wants to be.